Happy Thursday, Everyone! I hope you’re getting as excited for Christmas as I am! I’m much further behind in my Christmas preparation than I usually am, though our home is filled with Christmas music and talk of decorating and baking. I have to start actually working on it, there are only three weeks until Christmas! Some of our decorating is done, but we have yet to get a tree. I’m a big stickler for having a real tree, and the ones we looked at yesterday looked pretty sad. I’m sure we could have dressed them up a bit, but I have a difficult time with the idea of spending money for an already dead looking tree. So I get to spend tomorrow out Christmas shopping and looking for a tree! Anyway, today I’ve been feeling a little under the weather and wanted something nice and warm to contrast with the cold outside. So I decided to make something… I’m not entirely sure what to call it, but it tastes good! That’s what really matters anyway, right? I just threw some stuff in a pan. 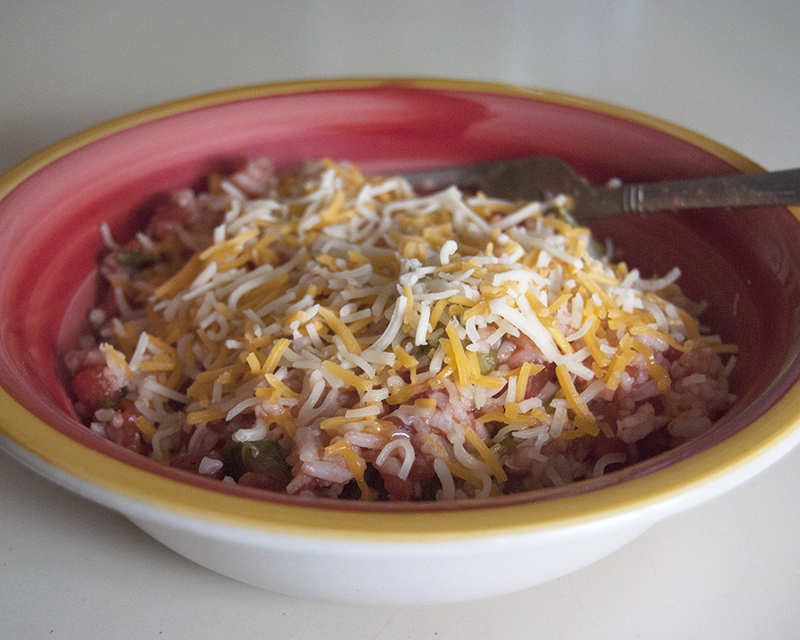 Rice, a can of tomatoes (I hate using the canned ones, but it’s all I had), jalapenos, brussel sprouts, margarita mix, pepper, garlic and onion powder, oregano and a bit of pink salt. Then I topped it off with some shredded cheese! Yum! I hope you’re staying warm and cozy on this chilly December day. Have you gotten a Christmas tree yet, or do you like to wait a little longer? I’d love to hear from you! Have a wonderful day!